The yud in the pai pshuta is almost totaly stuck to the gag. Many opinions that I heard are lenient because there is small piece sticking out to the right of the yud. I think this is regular issue of kav mashuch b'shave that is pasul, because the majority of the nekuda is connected to the gag. Therefore one should first add ink to widen the nekuda to the right, and only later erase a part of the dibuk to allow a better picture of the pai. This mezuza is unique: the space of the stuma is not normal. 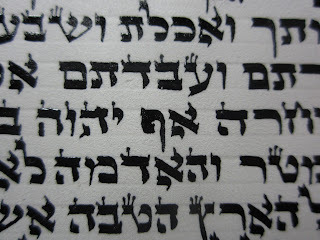 A. minhag sfarad [and many ashkenazim] place a space of 9 letters before ve'haya, but no space, or minimum space [3 or 4 letters only] after uvshe'arecha. This stuma is mentioned in SA OC 32 in regard to [the spacing before parshas vehaya in] tefilin, and they use the same idea for the same stuma in mezuza. 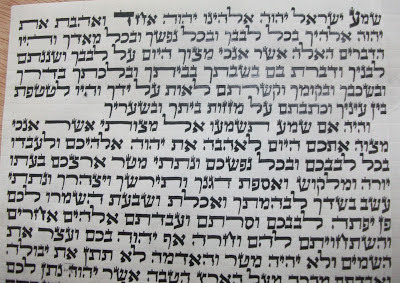 This stuma is according to Rambam, that 9 letters space in the same line before the begining of the script is a stuma. B. small space of less than 9 yudim after uvshe'aracha and same space before vhaya, so there is no 9 letter space in one line, and only a combination (b'tzeruf) of the 2 small spaces together there is a 9 letters spacing. This is a stuma according to Taz in tefilin, and many ashkenazim follow this opinion in mezuza as well.